If you would like to give up mashed potatoes but can't imagine doing so, try pureed or mashed cauliflower—you may never look back! Mashed cauliflower is a great substitute for mashed potatoes—they have a similar look and feel, and are low in carbs and high in nutrients, and the "cauli-taste" is very mild. Try it even if you think you won't like it—many non-believers are now huge cauliflower puree fans. Although you don't need to add flavor, throwing in a little garlic is a great addition or Parmesan cheese or both. Break the cauliflower up into florets, or just chop up the head into pieces. Microwave or steam until it's tender—a fork should easily pierce it. Place cauliflower in a food processor and blend until smooth and creamy; season with salt and pepper. Taste before adding any butter and/or milk—you may decide it's creamy and flavorful enough on its own. If not, add the butter, milk, and/or cream and blend until mixed in. 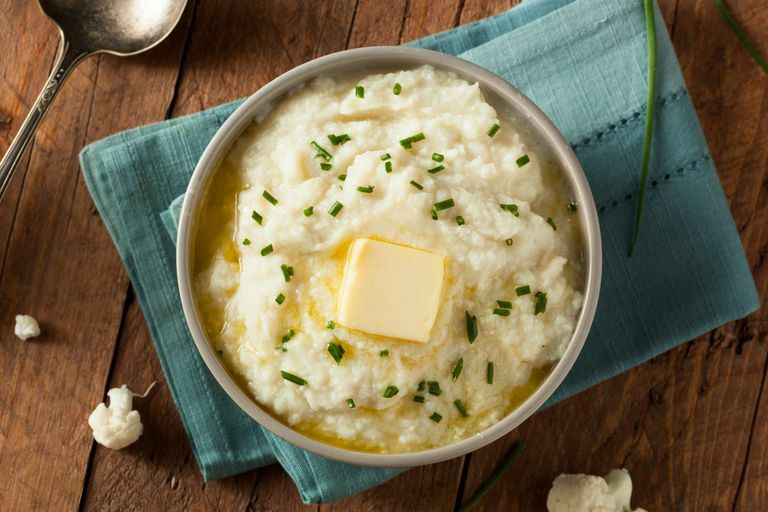 If you'd like the cauliflower puree to have a more "mashed potato" texture, you can add instant "potatoes" made for low-carb diets, such as Dixie Carb Counters Instant Mashers. Other people use a small amount of real potato or instant potatoes to improve the texture, but, to be honest, you don't need any of these additions.